One of my cat's favorite things to do, I hear other cats like it too, is to lay down between the keyboard and the monitor and roll toward the keyboard. This is in hopes of being scratched on the head which I'm a sucker to do. Rolling over the high profile keys of Apple's older keyboards causes havoc with disc ejection, volume and Expose control. I know i should train him not to do that but I really don't mind him there. I just hate the havoc. 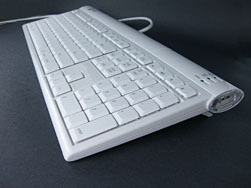 Now, I also have a Macally made Slim keyboard for another Mac whose keys are flush with the body very similar to this. This low profile keys keyboard is pretty cat proof on roll overs. If someone who has a low key profile, Mac compatible, keyboard and really misses the high profile type let me know. I'm never "lost" cause I always know where "I" am. I just may not know where anything else is or how to get there.